This is the time of year when birds begin their reproductive cycle in the northern hemisphere. People find eggs, nests, and baby birds and try to help them. Generally, that is not a good idea. Only 10-20% of songbird eggs ever result in an adult bird. The eggs might be infertile, die during incubation due to genetic or environmental causes, or be eaten by predators. Weather might blow the nest out of the tree or the young might starve. 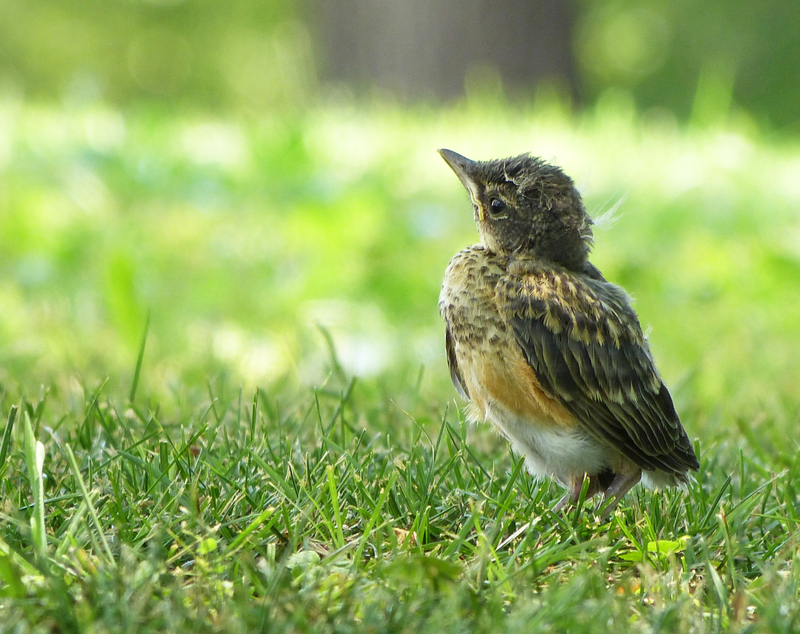 When young birds leave the nest they cannot fly and are still dependent on their parents and the risk of death from predators and weather is amplified. During the first five days after hatching, baby birds are blind, naked, helpless and cannot maintain a steady warm body temperature. During the next five days or so their eyes open, they develop thermoregulation, and grow some feathers. At about 10 days of age they leave the nest. They are now fledglings. Here’s something that most people don’t realize: the young jump from the nest, unable to fly, and for the next ten days or so are fed by their parents. Unfortunately this stage is when they are most likely to be seen and found by humans. Humans, being the empathetic creatures they are, feel sorry for this poor bird that “fell from its nest” and try to “rescue” it. Don’t do it. The parents may not be seen but they are there, taking care of their offspring until the young can fly. If you take the bird away, you badly disturb the bird family and you are unlikely to take care of the bird as well as the parents can. And don’t try to return it to the nest. Leave it alone. Repeat: leave it alone. Occasionally, a young helpless bird falls or is knocked from its nest or a tree trimmer trims the wrong branch and the whole nest comes down. It this case, the babies or eggs will not survive. So what do you do? Well, if you have a bird rehab center in your area, call them. They have the skills and dedication to take care of the birds. But don’t just pick up the bird or egg and take it to a vet or wildlife official or nearest biology department because it is unlikely that they will have the time or resources to devote to hatching an egg and/or raising a baby songbird. Go to the Cornell Laboratory of Ornithology for more information on orphaned birds. Sure, it’s difficult to leave a baby bird alone when you see it on the ground. But this is how nature has operated for millions of years; human interference rarely helps. So leave the bird be unless you are absolutely certain the bird is abandoned and in trouble and you have a place to bring it for experienced care.